STEPHANIE Robson could never compete with her school friends on the sports field. Born with cerebral palsy, the Gympie resident has struggled with her cognitive ability, balance, coordination and fine motor skills. But when Stephanie was 16, a teacher noticed something that made her not just equal to her peers, but better. Stephanie could take a blank canvas and with a few brushes of paint, transform it into a work of art. Now Stephanie is in the running for one of the southern hemisphere's most lucrative open art prizes. Her stunning interpretation of the meaning of life has impressed the judging panel of the inaugural LifeArt Worldwide competition. She is among 80 international and Australian artists vying for the $15,000 first prize, to be announced at the Sunshine Coast TAFE's spring festival, from October 25 to November 3. 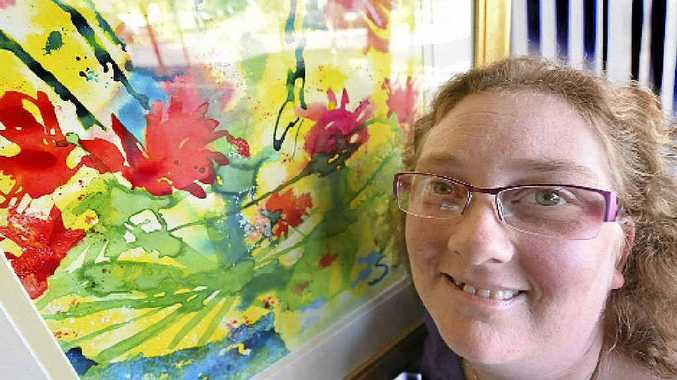 For Stephanie, who is now 31, painting means so much more than money. "I love painting. It means colour, freedom and happiness," she said. "I'm very excited about people being able to see my paintings."